As if last Friday's dinner at Alto wasn't serendipitous enough for the gathering it afforded of the "Mt. Rushmore of wine bloggers," it also gave me the chance to catch up with a couple of folks I'd last seen when in Piedmont earlier this year. Did I mention they just happened to be the evening's guests of honor? What we'd all convened for was the opportunity to taste a vertical of every vintage yet bottled of "Torbido!," the signature wine produced at Azienda Agricola Weimer-Gygax Cascina Ebreo, and to do so in the company of Cascina Ebreo proprietors, Peter Weimer and Romy Gygax. This was my first time joining company with Romy but I'd had the unexpected pleasure of meeting and tasting along with Peter Weimer when he was invited by his friend, Federico Scarzello, to present Torbido! to a small group of journalists, myself included, who had signed on for a vertical tasting of Scarzello Barolo that had been officially organized as part of the Spring 2010 edition of Nebbiolo Prima. 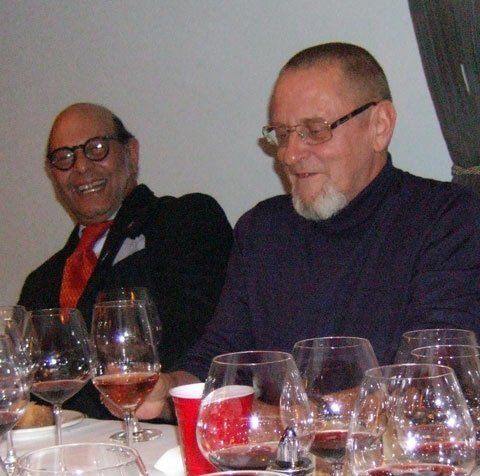 Peter Weimer, in the Scarzello tasting room in May 2010, and his wife, Romy Gygax. I somehow neglected to snap a photo of Romy on Friday, so I've borrowed her pic from elsewhere; hope you don't mind, Romy. Peter and Romy purchased the property known as Cascina Ebreo ("Jew Farm," as DoBi so succinctly translates it), situated next door to Elvio Cogno in Novello, in 1991. Two years later, they left their home and former careers in Swizerland — Peter, who is German, was an engineer, and Romy, of Swiss descent, a banker — to take up permanent residence at their estate on the Ravera hill above Barolo. What vines already existed on their property were in such neglect that they saw no choice but to grub them up and plant anew. Peter, I think, looked at this as a positive, as he would be able to work with his own vines, his own babies, to learn how they grow and behave from youth onward to maturity. What the couple chose to plant, on their 2.1 hectares of vineyards, were Nebbiolo (1.1 ha), Barbera (0.6 ha), and, nontraditionally for the area, a little bit (0.4 ha) of Sauvignon Blanc and Semillon. 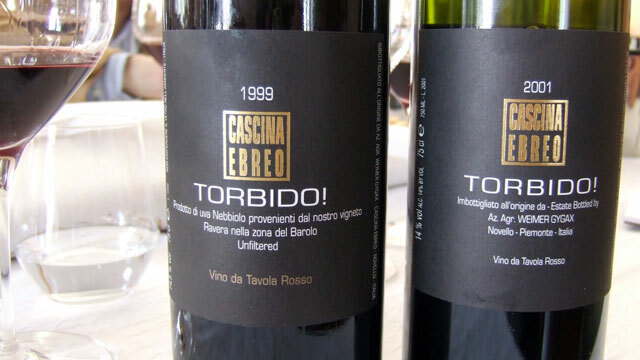 1999 and 2001 Torbido!, tasted in Barolo in May. In 2006, their first vintage, only a Barbera was produced. 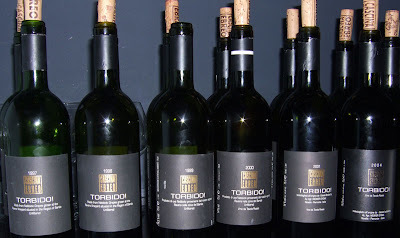 With the 2007 vintage, "Torbido!" was born. Produced entirely from Nebbiolo grown on the Weimer Gygax estate, the wine sees a vinification and aging regime that, in combination with its origins, should by all rights lay due claim to the title of Barolo. When Peter submitted a bottle of his 1997 Nebbiolo to the tasting panel for DOCG approval, the panel deemed his wine of very fine quality but too cloudy/muddy (torbido) to meet with the "typicity" for Barolo. (Peter, who bottles his wines without filtration, thinks the panel members must have shaken the bottle prior to pouring.) 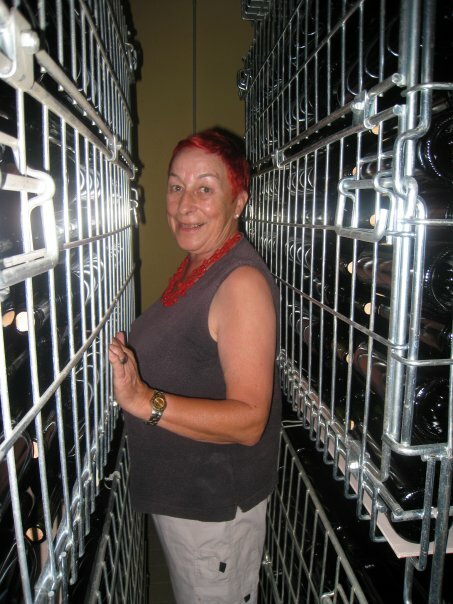 Though given the opportunity to submit another sample, Weimer rebelled, instead personally choosing to declassify the wine to Vina da Tavola status and to name it "Torbido!" 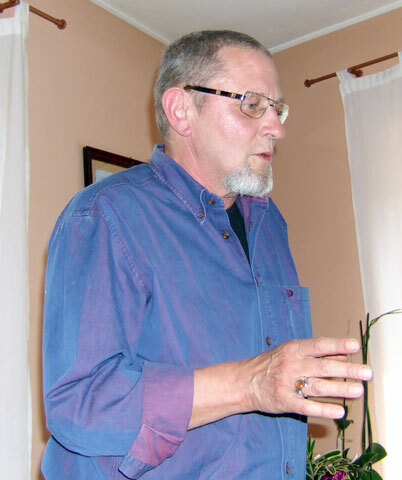 — a snub of the nose to the tasting consortium and a statement of pride regarding his own farming and production techniques. Peter and Romy have stuck with the decision ever since. Though Peter does not consider himself part of the "natural wine movement," or of any movement for that matter, he does consider his wines to be very natural. Farming on the estate is entirely organic, with application of some biodynamic practices as seen fit. Aside from two pumps that are used to move the wines from place to place, no technology is utilized in the winery. All of Peter and Romy's wines are fermented on their native yeasts and bottled without fining or filtration; the only thing ever added throughout vinification, elevation and bottling is a small quantity of sulfur dioxide. Weimer and Gygax release "Torbido!" 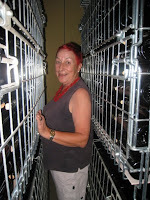 only in what they consider to be high quality vintages. 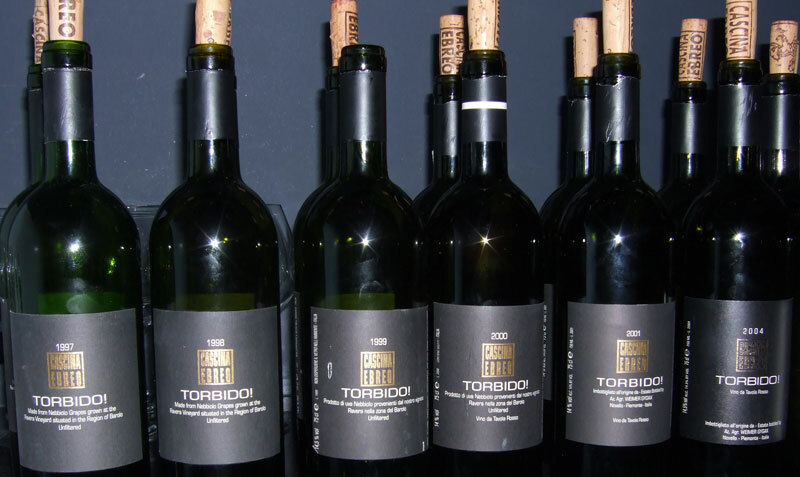 The wine dinner at Alto presented us with the opportunity to taste every single vintage of Torbido! thus far released: 1997, 1998, 1999, 2000, 2001 and 2004. I had tasted the 1999 and 2001 vintages during that surprise meeting with Peter earlier in the year and had enjoyed them both for their combination of power and clarity of expression, so was looking forward to revisiting them in the mix with their older and younger siblings. 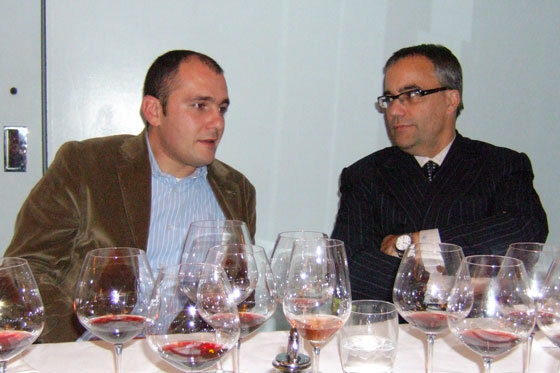 All of the evening's wines (including a spectacular bottle of 2002 Giacomo Conterno Barolo Riserva "Monfortino") were provided from the personal cellar of Dino Tantawi (at left above, with Peter Weimer), owner of Vignaioli Selection, Cascina Ebreo's US importer. 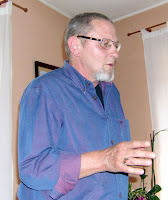 Dino offered the Monfortino as counterpoint to Peter's "Limpido!" — his doubly-declassified Nebbiolo from the difficult 2002 vintage. Though the Monfortino was fabulous (no problems for Roberto Conterno in '02), Dino's demonstration wasn't without merit: the 2002 "Limpido!" was showing very well, and a case of it can be had for about the same price as, maybe even less than, a single bottle of Conterno's Monfortino. The wine of the moment, and my favorite Torbido! of the night, was the 1998, open-knit and giving, all elegance and prettiness, an excellent expression of the sometimes delicate, feminine side of Barolo from the Novello district. If I were to look at a vintage to lay down for the long haul, it would be the 2004; all primary fruit and coiled up muscle now, the wine shows excellent balance and a fine integration of fruit and wood components, tannin and acidity. Both the 2001 and 1999 were showing well, very much as I remembered from this spring — the '99 riper and more opulent (and apparently Peter's favorite), the 2001 more tannic and classic in style. 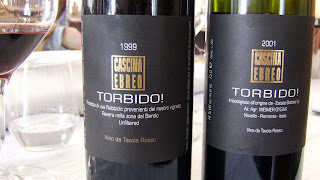 The 2000 Torbido!, though not among my favorites of the evening, was a pleasant surprise; not at all overripe or nearly so developed as many other wines from this dry, hot (and initially severely overrated) vintage, it showed surprisingly bright acidity and chewy tannins. The only weak point in the lineup, though I didn't find it anywhere near as objectionable as did Brooklynguy, was the 1997. A tough year for a first release, '97 was another hot, ripe vintage and this, unlike the 2000, has developed notes of advanced maturity and fading fruit along with a corpulence of texture not quite supported by its lower-acid structure; that said, it was the favorite of at least two other guests. Federico Scarzello, at left, with Alto owner/operating partner Chris Cannon. In a reversal of good fortune, Federico Scarzello was also in attendance at the Torbido! dinner. It was no fluke, though, nor entirely a surprise; Scarzello's wines are also imported by Vignaioli, and Federico had led a group through a retrospective tasting of his family's Barolo over lunch at Alto earlier that day. Federico Scarzello and Peter Weimer in the Scarzello cellar, May 2010. Though it didn't come up over dinner, Peter told me earlier in the year that, beginning in 2011, he will be handing over farming and winegrowing responsibilities at his estate to Federico Scarzello. Peter no longer feels up to the rigors of working the fields and cellar on his own. He now prefers to hand over the reins to a friend — he's known the young Scarzello since 1986, when Federico was still a teenager — rather than to sell to an unknown quantity. 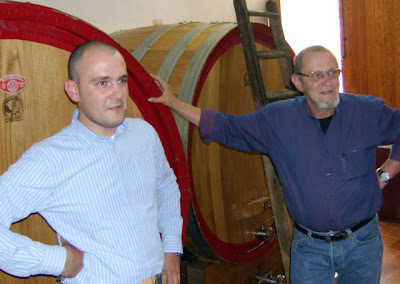 It seems likely that Peter's label and the Cascina Ebreo name will be maintained, with an indication that the wine is produced and bottled by Scarzello; however, the finer details have not yet been determined. What's most important to Peter is that respect for his land and vines be maintained, That's something, in turn, I think we can all respect. I agree that the 1997 was a disappointment but I admired Peter for letting that wine be what it was meant to be: not a great vintage (as we in the alternative press know!). His wines are anachronistically oxymoronic: they are new old, they are rustic contemporary. And man, I wish I had a bottle of the 99 for my Thanksgiving! Great post... and wow, man, so great to finally meet you in person! Thanks, Jeremy. It was great getting to hang with you, too. Hopefully not so short, next time around. Agreed on Peter's '97. A tough vintage for his first release, and nothing manipulative about it. As for the modern/traditional mash-up represented in the style and history of the estate, I was thinking along very much the same lines. The new old is a great way to put it.